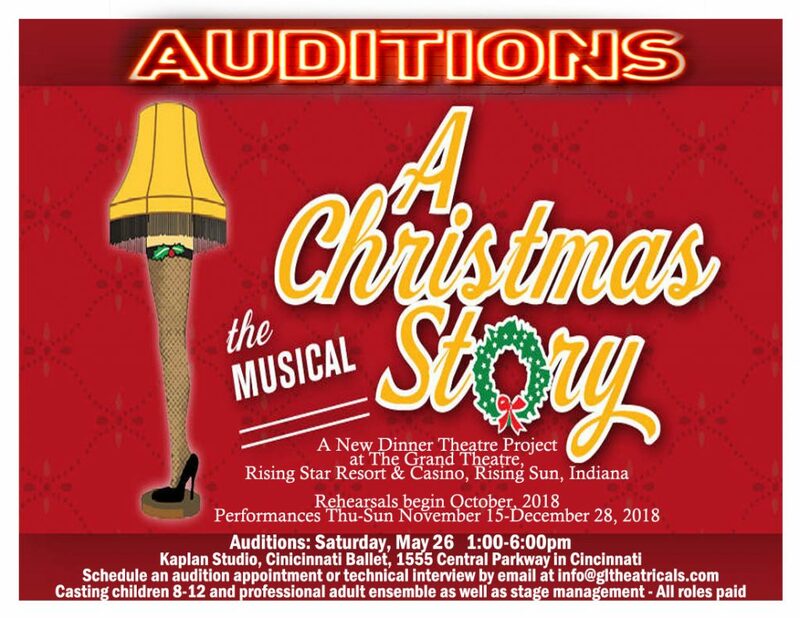 Ghostlight Theatricals in association with Rising Star Resort & Casino in Rising Sun, Indiana will hold auditions for “A Christmas Story: The Musical” on Saturday, May 26 from 1-6pm in the Kaplan Studio at Cincinnati Ballet, 1555 Central Parkway in Cincinnati. To schedule an audition, actors should email info@gltheatricals.com and request an appointment. Video submissions will also be accepted prior to May 26 at that same email address. “A Christmas Story: The Musical” is a professional dinner theatre production at the Grand Theatre at Rising Star Resort & Casino. There are principal roles available for children who can play ages 8-12 and ensemble roles for adult singer/dancers. Children auditioning should have very strong acting, singing and dancing skills and some on-stage experience. All performer contracts will include negotiable weekly compensation as well as dining vouchers. There are stage management and technical crew positions available as well. Rehearsals begin in October with weekly dance classes for young actors and daily rehearsals beginning for everyone October 29. Performances are Thursday-Sunday November 15-December 28, 2018. Rising Sun is located 45-minutes from Cincinnati just across the river on Highway 56. Auditioning actors will be asked to provide a photo and resume and prepare 90 seconds of material including one comic monologue and one song in the style of traditional Broadway musicals. An accompanist will be provided. Some actors may be asked to sight-read from the script or score and learn a brief dance combination. Those interested in stage management and technical theatre should also request an audition time and prepare for a brief interview. All auditions and interviews will be conducted by Director Darrin Murrell and Producer Gerald Pauwels. More information about the company can be found at www.glthetricals.com.